Detectives Hunter and Garcia are called to one of the most shocking crime scenes they’ve ever witnessed. One officer describes it as the one he’d most like to erase from his memory after thirty-seven years’ service with the LAPD. A young girl has been strangled, then skinned, with a bizarre message left on the body. It’s the kind of challenge Hunter thrives on, but he’s barely started tracking down the killer, when the FBI turn up and drop a bombshell - this isn’t the first victim. 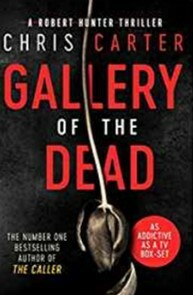 Hunter & Garcia have to look past the inter-agency rivalry, and work alongside the FBI, to stop a killer, who perhaps doesn’t just kill for the thrill of it, but the artistry. Serial killers, cleverly constructed, make for a compelling antagonist, as they generate morbid fascination, and that’s exactly what we have here. The crimes themselves are gruesome in the extreme, the killer’s motivations murky at first, moving to macabre as they’re revealed. Carter leans on his experience as a criminal psychologist to make us wade into some pretty dark places, and Hunter pitting his wits against his adversary has shades of Hannibal and Clarice, although the ultimate resolution could have delivered a little more bang for the buck. Carter has the short, punchy chapter format down to a fine art. It makes for a pacey ride, shuttling between the uneasy truces Hunter has with the FBI, and seeing through our killer’s eyes [first-hand]. Some of the internal politics between the Ultra Violent Crimes team and the FBI start to feel like we’ve been down that road a few times before, and slow the momentum - but overall, a definite page turner, and easy to see why Chris Carter has earned his place at the table.